If you are looking for unique sources of protein, try calamari. Calamari is the Italian word for squid, a type of shellfish. Like most other fish, calamari offers protein with little fat and a myriad of vitamins and minerals. Although a lean source of protein, calamari contains a substantial amount of cholesterol and is often served fried. In a 3-ounce serving of raw squid, or calamari provides 13 grams of protein. Compare this to the 18 grams of protein in 3 ounces of raw chicken breast or 17 grams in 3 ounces of raw shrimp. Like other animal proteins, calamari is complete, meaning it contains all the essential amino acids your body cannot produce on its own. Most vegetable and grain proteins lack one or more of these essential amino acids. Along with protein, calamari is also a source of vitamin B-12, potassium, iron, phosphorus and copper. The Institute of Medicine recommends a minimum of 0.8 grams of protein per kilogram of body weight. If you weigh 150 pounds, you need at least 54 grams of protein per day. A 3-ounce serving of calamari offers almost one-quarter of these needs. You can safely consume up to 35 percent of your calories from protein. 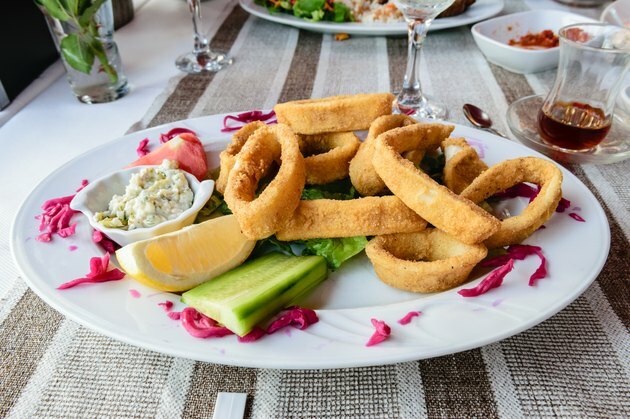 Although calamari offers protein, eating it battered and fried may not be the best option. Frying the calamari does not affect its protein content, but it doubles the calorie count and raises the fat content from 1 gram to 6 grams. Choose grilled, baked or steamed calamari as a healthier option. If you do order fried calamari, use lemon juice or marinara for dipping rather than a mayonnaise-based dip. The protein in calamari comes with a significant amount of cholesterol -- 198 milligrams per 3 ounces of raw squid. The American Heart Association recommends limiting cholesterol to 300 milligrams per day to protect you from heart disease. If you choose to eat calamari, make an effort to limit other cholesterol-containing foods that day.